For a long time, I was afraid to share my story. Friends. Family. Random stranger on the internet. Many struggle with sharing their story. In fact, if you don’t have this fear, you may be in the minority. Somehow we’re afraid of sharing who we truly are. We’re afraid of doing the only thing that we can, and must, do. You see, you can’t be anyone else. Your purpose is to be fully yourself, and share what you have inside of you. Yet so many of us are afraid of doing exactly that. We’re afraid of being rejected, because it may have happened in the past. If you want to get paid to do what you love, you have to stand out, and you have to let your own unique strengths shine. People want to connect with you. They want to hear your worldview, your opinions, and above all, your truth. I know it’s not easy. I don’t think the fear ever goes away. The problem then isn’t the fear, but how you relate to it. The more you listen to that fearful voice inside your head, the more you sink into obscurity, and the farther away your dreams drift. You can give into your fears and doubts. You can take your thinking seriously. It’ll lead you to a life where the walls keep closing in on you. You’ll eventually develop claustrophobia. Or, you can realize that your fears are just thoughts that you’ve decided are important. Now, it’s not as easy as just seeing that your thoughts are thoughts, although it can be. You’ve developed a habit of worrying and thinking. You’ve grown accustomed to the what if mindset. It may take time to break. Or it may not. But it starts with seeing through the illusion that you’ve created for yourself. And you respond to it. You believe it has validity and power. You defend yourself without realizing that you’re arguing in your own head. The solution is to not react, to let the thought drift by, like a fallen leaf riding a stream off into the distance. Thoughts don’t hold power. They can’t command your attention. If you watch them and let them pass, they float away. At first, they’ll call their friends and family. But as you let them pass, they’ll dissolve into imaginary dust. This is what’s worked for me. Whenever doubts come up in my mind, I still feel them, but I also don’t take them seriously. I know they’ll pass. I know I’ll feel better, and when I do, I’ll think differently, because I’m in a different mood. Remember, you feel your thinking, so just because you think you don’t have something to say doesn’t make it so. It just means that you’re entertaining that thought right now. It may seem mundane to you, but it’s not. People need to hear your story in order to trust you and get to know you. 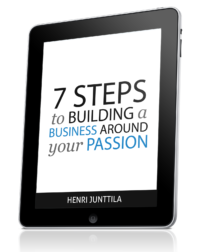 Your lifestyle business will be built around you and your story. People want to buy into you. It may not be great at first, but the more you share it, the more you learn what inspires people, and what works. It all starts with challenging your assumptions and fears. P.S. What better way to share your story than to start a blog? You can learn how to start a blog here. 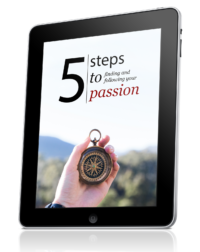 If you’d like to learn how to overcome writer’s block, find your voice, and write blog posts readers love, check out my step-by-step book here. Henri, I am so glad you touched on this; touchy subject, in today’s article. I really do struggle with sharing things but I ve noticed when I show my audience trust, I tend to get the same in return. It’s sort of like being afraid to volunteer a question in class and then finding other students who wanted to know but were also afraid to ask…they really appreciate the pressure being taken off. SO many doors begin to open in that endless closet of fears and doubts. That’s what it is. When you say hi to your fears and share (relevant) stories anyway, your readers will notice, and even feel relieved, because they feel the same way. Thanks for the comment, Cheryl! It has took a few years, but now I finally have a blog and I’ve started to share my story. Slowly, but surely it goes, step by step. PS. 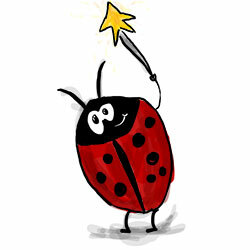 The ladybird is awesome! Ha. The synchronicities pile up sometimes, don’t they? I’m glad you’re on the path. And yes, one tiny step at a time is the way forward. At least it was for me. Keep on rocking, and let me know if I can ever help! you mentioned a fear that was holding me back for quite a time. It was the time where I was playing around with the idea of starting my online business. Being the only one in my family who’s interested in this, I wondered what they would say. Not a single person I knew was engaging in online business, I had nobody to speak to. Fortunately there are so many great podcasts out there. It was Pat Flynn and his book “Let Go” who finally convinced me to take action. I joined a training program, got enough self-esteem to stand my ground and I never looked back since! You’re right on the spot with this post. Though I do think that positive thoughts can hold tremendeous power, we all have to train ourselves to let go of negative thoughts. It’s human to encounter fear for the unknown, but the life is greatest outside our comfort zone. As soon as one understands this, it’s easier to let fears and worries pass away and see it as a great excercise to extend the comfort zone. Thanks for unearthing the fundamental obstacle in many of us, we struggle with I call identity complex. We kinda in the middle of what we really want and what is imposed on us and that leaves us stranded with all sorts of frustrations and disappointments. I have also decided to tap into my story and spread it around because that’s the only way I can be the real me that I am born to be. Thanks for the simplicity in your writing and inspiring us. Just the thing I need the most. Fear has a strong hold on me, like a clamp that just won’t get loose. I know I have to not let it take over but it’s so much harder to do. I worry so much about how others would react and that’s held me back for so long. That’s also why my blog is 2 years old but haven’t accomplished anything. I’m scared to write what I want and need to. Thanks for sharing this, Henri. I’m not saying I’m not scared now or tomorrow or the day after but this gave me more motivation to brush off fears and worries. Everything you say here is spot on Henri! I have these negative thoughts myself sometimes too. But I know I’ve got to do what I’ve got to do. I’m still in the process of breaking the “what-if” mindset. But every time I sit at the computer to start writing and hit that publish button, I feel a sense of accomplishment, and I feel a tiny bit stronger. I’ve faced my first setback with some negative comments on my writing style but I’m not letting it keep me down! Hey, Henri, congratulations on the baby!! May he and your big boy bring much joy and light into your lives. Thanks for the post — I needed a kick in the pants regarding the power we choose to give to our thoughts. I’m going to try to just breathe through them from now on. Grattis till ditt nya barn! Vi har fyra vuxna barn och ett barnbarn (fem månader). Det har varit så roligt! I have been thinking about speaking my mind in my blog. All I have posted is a scenery from South Africa which I visited about 2 years ago. For a long time I have claustrophobia. Your article makes me think, may be if I take the courage to share what I think and feel, my claustrophobia will go away, may be. I think I’ll try. Thanks for sharing what you feel. Because you’re right. It helped me make up my mind. Ambika, I do think it’s a good idea to share your feelings and your problems. Even if it doesn’t help your claustrophobia, you can feel good about possibly helping someone else (someone going through the same thing), so they don’t feel so alone. And probably it would help you, too, because sometimes by talking about things, we take away some of their power over us. Also, being less ashamed about something also might make it easier to overcome it. Congratulations Papa x2 and well wishes to the Mother and baby. It might be time for you to go syndicated television world wide. You’ve got the chops. Keep growing. Think Oprah Winfrey. Good job and Love to your family. Thanks! Syndication? Now that would be something. Congratulation on the new born baby! I have doubts and fears to share my story, because I know when I open up I will have to describe the shadow sides of my family members, no matter how I put it in the narrative. It’s always in the back of my head that if I somehow succeed and my family members ever hear/read about what I have to say, they might got hurt. There’s a specific personal tip I actually want to share with the world and it might heal a lot of people, but until today I haven’t share it because yes, it involves forgiving childhood trauma. And I still do not have the heart/courage to face my parents if they ever hear my voice about it, although I am not pointing fingers at them at all. Thank you for the post, it made me realize I still want to let a lot of things go. Thanks Pulsatilla, for the comment, and for sharing! Pulsatilla, I always feel that if something you share could help someone, then it’s good to share it. That’s why I keep talking about my grief on my blog, even though it hurts sometimes to write it. You could always, if you choose, express how you aren’t blaming your parents, etc. whenever you’d talk about it. That way, if they saw something, they could see your non-blaming feelings, too, and maybe they could understand. Helping yourself and helping others is a good thing, if you can do it. I checked out your art, and it’s amazing! I signed up for your emails, too, just so I can keep seeing more. Thanks Pulsatilla and Chris. This addresses my fears around telling my story. The takeaway for me is “Fears are just thoughts you’ve decided are important.” That is so true and yet so difficult to remember. If I’ve decided they are important, then I can change my mind and let them pass. Thank you for sharing. Exactly. You don’t even have to try to change your thoughts. Just let them be, like you let the clouds be in the sky as they pass. spoke right to my heart. Everyday is a challenge to put yourself out there in your writing, all raw and soul. It is a challenge, but also a thrilling adventure. You facing your fears over and over again and seeing that they are mere assumptions. Assumptions that are often wrong. Great post and thanks for the motivating and encouraging reminder Henri! I’ve recently realised that one of my goals has been stuck in this exact place for years! Wanting to share my story with the aim of helping others but being afraid of putting myself out there and being seen. However, I wasn’t consciously aware that this was in fact stopping me. Now that I’m aware it helps as I can get comfortable with being uncomfortable and start to question and push through these limiting thoughts. Its also great to be reminded that fear will always be there but we don’t have to listen to it or let it stop us from reaching our goals. It’s hard but I find making those baby steps really helps to test the waters and gain confidence. ( Talking of baby steps…Congrats and many blessings on the new addition to your family 🙂 ). I also think it also comes down to self-acceptance. Accepting our selves, our stories, our journeys as painful or embarrassing as we think they may be, and using that as part of our unique self and voice to help others. Like you said, we are all unique and have something to share. I’ve just purchased ‘ Writing Blog Posts Readers Love’! Looking forward to getting stuck in! And yes, they should teach this at school. Majority of the people has similar fear and I’m one of them, that was before though. We’re always hindered by the fear of unknown and believe me, the more we’re holding back those stories, the more they’re getting us really depressed so, its best to let them out. Great post as always, Henri. You pick up on the threads that are common to all of us and yet we tend to think, “It’s just me who feels this way”. Nice to be in good company. For quite a while, I was trying to move forward with business/website ideas that appeared to be the logical, rational choices. I kept hitting blocks and changing by mind about how I should proceed. And then I decided to just go for what was really in my heart, helping people create heart-centered relationships with their pets. Once I did this, all the pieces started to fall into place. When I shared this with a mentor, her response was revealing. She said, “What you were doing by creating the “rational, logical” options, was playing it safe. You were afraid of expressing what you really want to do and being rejected.” She was so right. I still have some fears and doubt, but they are on the sidelines now. I feel so energized and motivated being in the space of my authentic self. Congratulations on the birth of your son. Sending wishes for light, love and laughter to you and your family. My parents taught me that I’m an individual, someone unique, one that has nothing to fear or hide from in life. I’ve not always believed what they taught, having been thrown quite a few curve balls from time to time, yet I’ve never been afraid of what others may think of me. I’ve been called a risk-taker, and I’ve done my share of experimentation in my life; it’s not always been met with sunshine and lollipops from the people that I’m close to. That being said, there is one area I’ve been working on that is presenting some fear. I want to start a blog, and have been studying information on how to best get it off the ground. The more I study, the more I believe I’m running into “analysis-paralysis” and subconsciously avoiding the initial movement to get things rolling. Another part of my dilemma is funding. I just recently got a job and I’m digging out of a financial hole that I couldn’t avoid. Now that the paychecks are coming in regularly, I can start planning and saving to get a WebSite up and running, then get everything on-track. As for telling my story, I’m not afraid of doing that. In fact I know that there are others out there that have gone through the same kind of experiences that I have, and that I’ll connect with “my audience” in the process of revealing myself in my blog. I’m looking forward to becoming a member of your Lifestyle Liberation Academy in the near future, so I can learn more about fulfilling my dreams of having an on-line business, and connecting with other like-minded folks who can help me along the way. Thanks again for a salient blog post article! It does sound a bit like analysis paralysis. You may be looking at this as a bigger step than it is. See it as an experiment. Start a blog. Start small. It costs a few bucks a month for a web host. When you start, you’ll begin getting real experience, which will help you gain clarity on what you want to do, and how. You’re right, the whole idea of starting a blog right now is an experimental dream-scape that seems ginormous, but I’ve learned that action reduces the lion of terror to an ant of equanimity. I think I’ve got a solid idea of what I want to do, yet the initial movement toward my goals remains an enigma, confounded by the financial side of the equation right now. That will of course abate as I climb out of my current financial hole, and begin to have more disposable income to work with for the blog. But I’m confident that as time goes on I’ll get everything set in place regarding the Web hosting, and creation of my site, allowing me to proceed with the grand experiment to find my niche and begin to work toward my online business. As an aside, I know that becoming a member of the Lifestyle Liberation Academy will be a formidable boost to my efforts, as well as my confidence, and will propel me to greater heights as I move forward. Thanks again for you support and enthusiasm! Lovely article. Thank you for sharing your thoughts. I had a thought today…..